It’s February 13th, 2015. The Arizona State University Sun Devils take the field at Phoenix Municipal Stadium for the first time on this warm February evening. Hoping for a successful season in their first year at Phoenix Municipal, the Sun Devils sought to further their own legacy of success. The presence of the Sun Devils signals a greater change for the stadium however. Phoenix Municipal Stadium is no longer a Cactus League venue. The arrival of the Sun Devils marks an end of an era for Phoenix Municipal Stadium, a ballpark that enjoys its own long and storied past as a baseball venue, one that stretches back almost to the very beginning of the Cactus League. Phoenix Municipal Stadium has seen its fair share of action during its time in the Cactus League. The stadium that exists now on the border between Phoenix and Tempe- the welcome signs for both cities can be seen from the ball park- is the second ball park to bear the name of Phoenix Municipal Stadium. 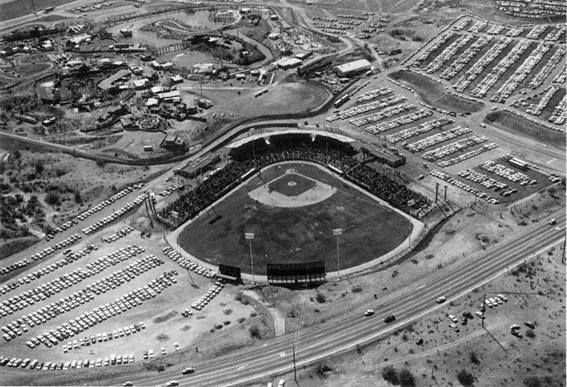 The Old Phoenix Municipal Stadium sat on the southern corner of Central Avenue in Phoenix. From 1947 until it was replaced in 1964, the old Phoenix Municipal Stadium served as the Spring Training home of the newly relocated New York Giants. Oddly enough, some controversy exists over where the Giants actually conducted Spring Training between the years of 1959 and 1964. Some sources have old Phoenix Municipal being demolished in 1959 and a new spring home not being established until 1964. Other sources, including multiple newspaper articles from the Arizona Republic, have the Giants at old Phoenix Municipal right up until 1964, when the team moved into the new facilities. Even with the Francisco Grande looming in Casa Grande, the now San Francisco Giants remained loyal to the Phoenix area. The team felt such a connection to the city and the stadium that after the Polo Grounds in New York, the Giants home field, was demolished, the light polls from the stadium found their way to Phoenix Municipal where they still stand today. 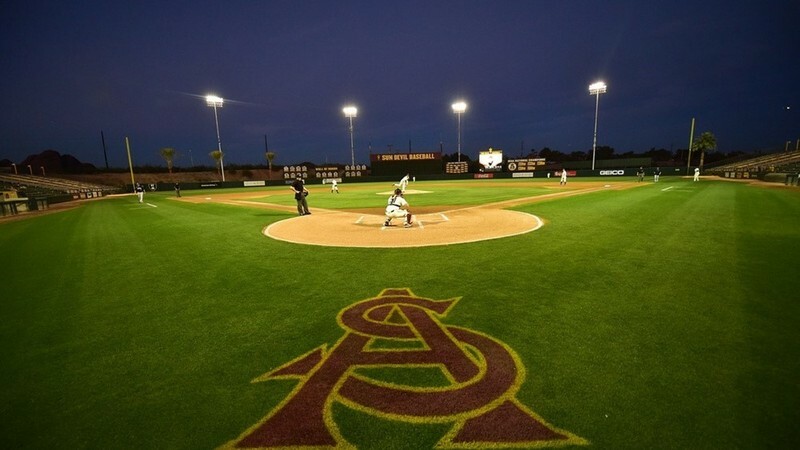 Modern visitors have the joy of watching Arizona State baseball games under the same lights that players such as Willie Mays and Willie McGee played under. Eventually, the Giants would lose a bit of that loyalty to the city of Phoenix, and, in 1981, the Giants relocated Scottsdale Stadium, swapping stadiums with their rivals from across the Bay, the Oakland Athletics. For the next ten or so years, all was quiet at Phoenix Muni, and baseball was played with little hiccup. However, by the early 1990s it was quickly becoming clear that Phoenix Municipal was too small of a venue for modern day spring training. 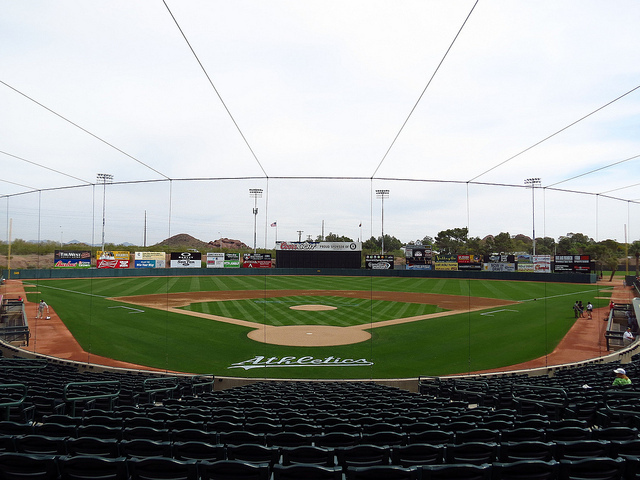 Fans clamored for a renovation and expansion project to bring the Stadium up to snuff with modern facilities, such as Compadre Stadium in Chandler or the newly rebuilt Scottsdale Stadium. Fans would have to wait over a decade longer before any substantial renovations were finished to the park. By the spring of 2014, on the 50 anniversary of the park being opened, it was clear the Phoenix Municipal's time as a Cactus League facility was over. The A’s found a new home in Mesa at Hohokam as the Cubs received a new park at Riverside in Mesa. Phoenix Muni in its twilight years had been deemed “too puny for spring training.” Being the oldest still occupied Spring Training facility when it was vacated by the A’s certainly did not help its prestige. That is not to say that the future of the stadium was ever in doubt. Arizona State University wasted little time in signing a long-term contract to play at Phoenix Muni. And while the stadium is now decked out in ASU’s maroon and gold, nothing can wash away its rich past of Spring Training baseball. ASU at Phoenix Municipal Stadium: This Picture shows a similar picture to the last. This is the view from behind home plate, with the additions and changes made by Arizona State University visible in left center and right center field. ~ Source: Unknown. ASU at Phoenix Municipal. Arizona State University, Tempe. In Sun Devil Athletics. Accessed December 6, 2016. http://www.thesundevils.com/facilities/?id=5. 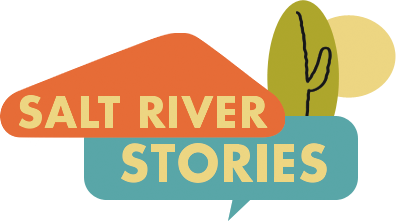 Connor Hillmann, “Phoenix Municipal Stadium,” Salt River Stories, accessed April 22, 2019, https://saltriverstories.org/items/show/245. Susie Steckner, Cactus League: Spring Training (Charleston, SC: Arcadia Pub., 2012). 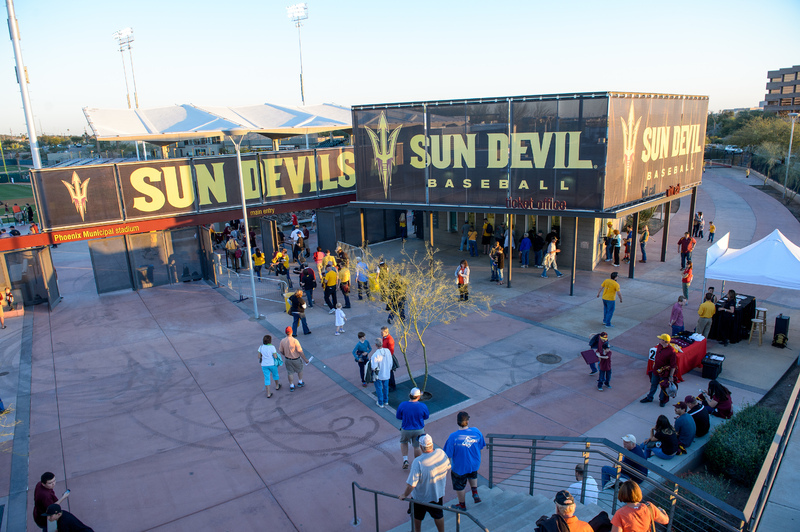 Arizona Sports, "ASU Baseball to Move to Phoenix Municipal Stadium," Arizona Sports, 2013, , accessed December 08, 2016, http://arizonasports.com/story/48155/asu-baseball-to-move-to-phoenix-municipal-stadium/. Frank Jackson, "Phoenix Muni Too Puny for Spring Training," The Hardball Times, April 14, 2014, , accessed December 08, 2016, http://www.hardballtimes.com/phoenix-muni-too-puny-for-spring-training/.